I sewed a bunch of pink scraps together. To save myself a lot of time, I decided to machine applique right onto a scrappy white background. If I wanted to quilt and bind the whole thing, I didn't think I'd have time to piece it all together (I was right. Glad I trusted my instincts). The whole time I was appliqueing, I thought about the message. What did I want to say? Right now (and I say this because it changes all the time - there are a lot of things I'm frustrated about), women's health is at the forefront on my mind. The great thing about art is that you can interpret it however you want. For me, I am concerned about women having access to quality, affordable healthcare. I have been a patient of Planned Parenthood and support them proudly. I remember what it was like to be a college student with minimal insurance. I wanted to proclaim loudly and clearly that I support women of all ages, races, economic situations, and places and their need for affordable (preferably free) birth control and quality healthcare. Constantly, as I worked, I was thinking of my friends, family, colleagues, students, and myself. Again, you can interpret the message as you will. In the end, "our health matters" seemed more universal, strong, and just, simply, had less letters. :) I used my new pinking shears to cut around the letters (this lessens or totally negates any fraying), glued them onto the quilt with a glue stick, and used a straight stitch to sew them on. The letters are NOT perfect. They are a little wonky. They are messy. That was my intent. Then, I quilted this bad boy (bad girl?). 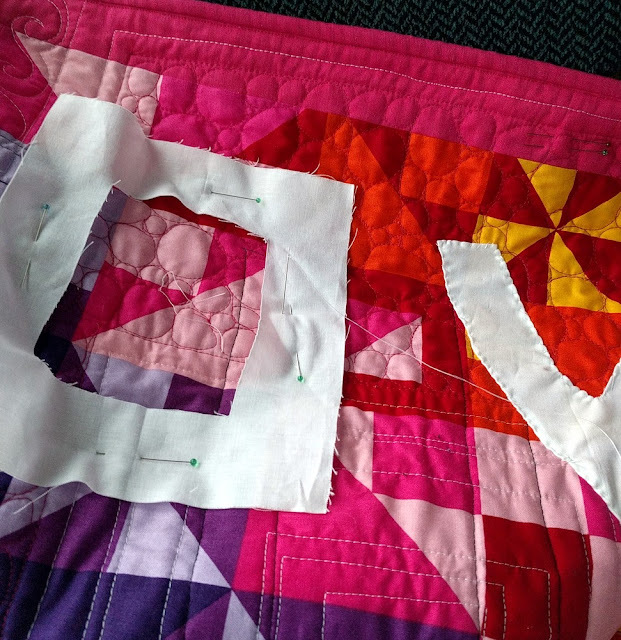 I used Aurifil 1100, a great, bright pink, to quilt pebbles inside the female symbol. I echoed the sign with my walking foot and couple of times, and filled in the background with spirals, using Aurifil 2024 (white). These are motifs that simply make me happy. The backing came along because I was reading about how protest/march signs should have a back. I'm proudly an LGBT ally and I support love of all kinds, so I decided to use this ingenious rainbow cheater panel from Northcott Fabrics in the middle (for non-quilty folk, cheater fabric means that I didn't actual sew all those colors together - it's one piece of fabric). I surrounded it with extra pink solid from Cloud9 Fabrics. Only after I quilted and bound the whole quilt (Thursday night, so less than 48 hours before the March) did I decide add a clear message to the back. So, on the bus, I hand stitched the word "LOVE." It's not perfect. It's messy. But it was so worth a little bit of a bus headache (plus, it took us over 6 hours to get to DC when it should have been 3.5 hours - our bus broke down 3 times, there was tons of traffic, and we stopped at a rest stop, which was also FULL to the brim with marchers, when we were still 2 hours away!). So then, how did the quilt hold up at the March? Well, it was a little heavier than I expected. I made it so I'd be comfortable holding it up and not dragging it anywhere near the ground. It certainly was large enough - the message read loud and clear. 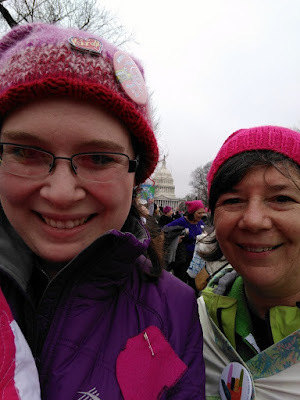 The picture below was taken right after we walked from RFK Stadium (where hundreds and hundreds of buses were parked, with people streaming out of them even at our later hour) to near the U.S. Capitol Building, where Congress meets. My lovely guild friend and march buddy, Lori (@gratitudequilts), made a gorgeous cape that says, "Diversity is our superpower." 2. "Wow, did you make that?" 3. "How long did that take you?" Lori took a couple of in-action pictures, unbeknownst to me. One lady shouted, "YES!! 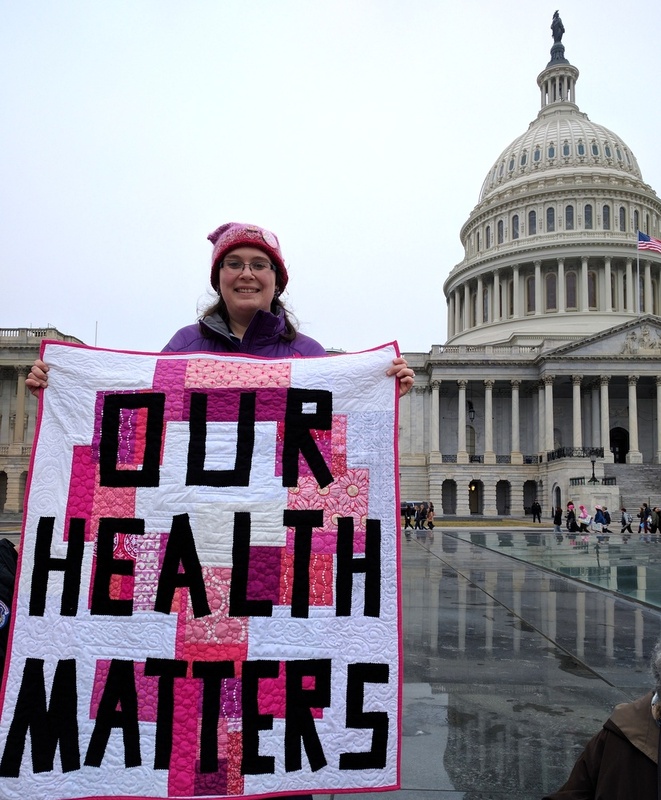 QUILTS FOR HEALTHCARE!" Over 50 people pulled me aside to take pictures. Lori and I were interviewed twice by reporters with video cameras (alas, we do not know where these interviews are). Even when my arms got tired and I wore the quilt as a cape, people were running up to us to take pictures. 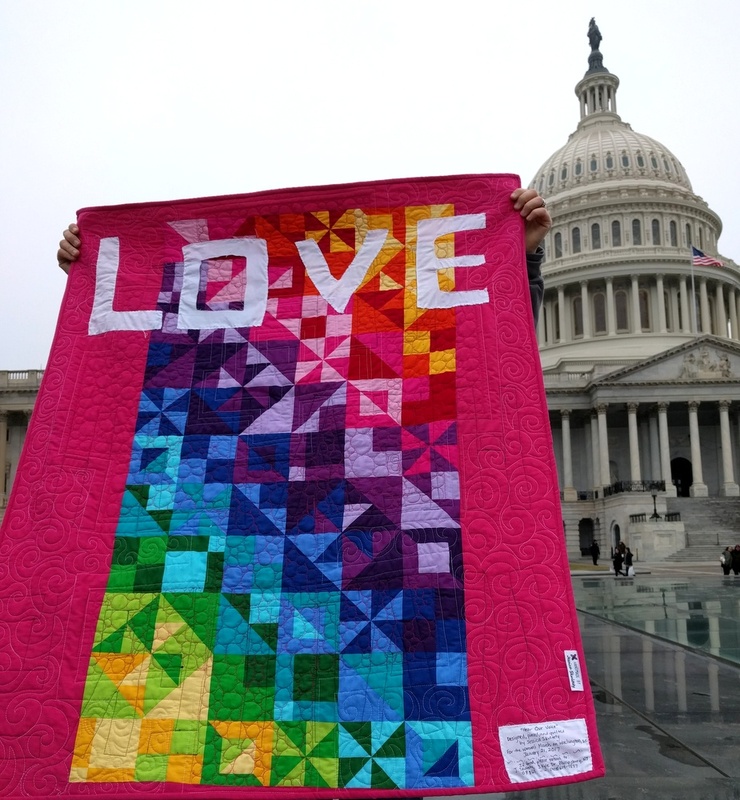 It was surreal to be a part of something so huge (over 500,000 people is the estimate from D.C) and to show a quilt to the public. I especially love the action picture below because you can see people smiling at the quilt! I climbed up on a raised platform (fountain?) in front of the Capitol for pictures. I can't describe how it felt to share this message in this particular place. Spread the love. The excitement of finally arriving in D.C.! 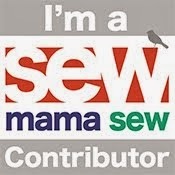 So many of my quilter friends were there, but alas, it was nearly impossible to find anyone. We came upon this scene as we were heading out. This was a couple blocks from the National Mall - not a place where you'll see most of the press pictures. THAT'S how many people (and signs) were there. It was literally breathtaking to see a peaceful protest of this magnitude, in person. One woman was asking marchers to write examples of people who made them proud to be a woman or to be at the March. I wrote down one of my former professors (now a close friend) and my guild's name. 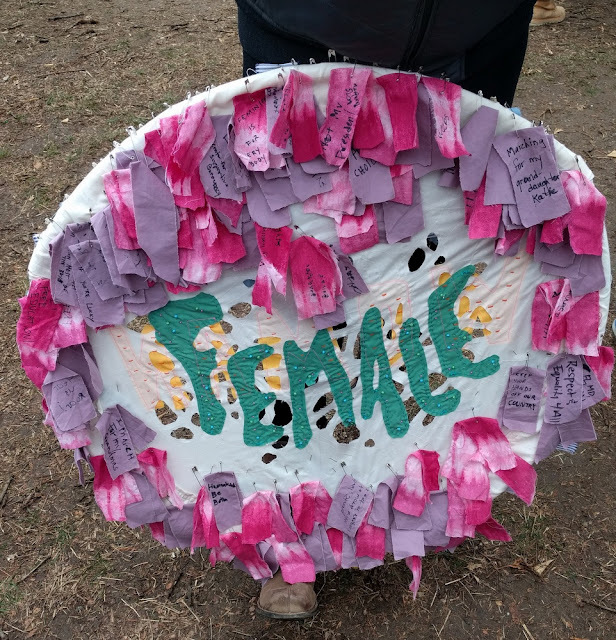 This was such an amazing and empowering protest sign, that also was fabric related! Love!! I made these cute little mug rugs to thank Lori for her hospitality and encouragement, and Tatiana for knitting me a hat. A little commemoration of the day. Lori left me pins for the March on a quilty pillowcase the night before. When I got home, I threw the quilt haphazardly onto the railing, and it produced a whole other, unintentional meaning. Love matters. I've come across two other quilts for the march. First is my friend Jess's (@jtlevitt) quilt, which she holds proudly below (shared with permission). She's going to finish it up with quilting and binding shortly. 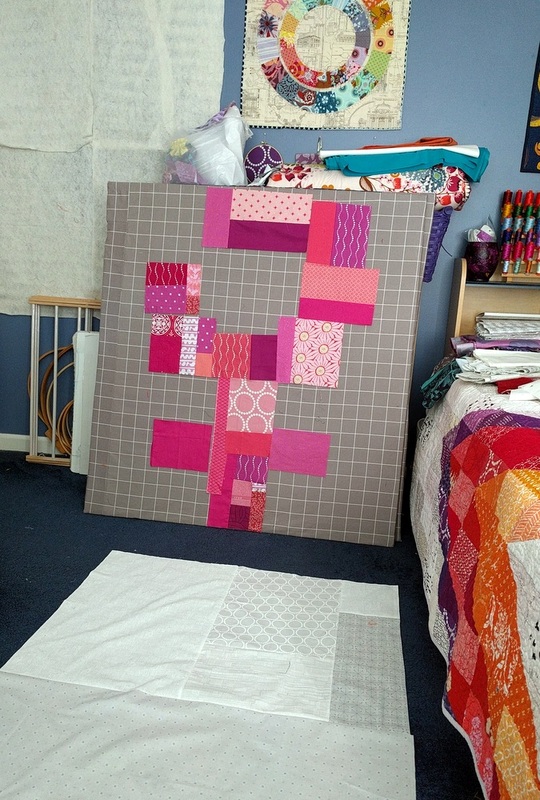 Darci Sews also made a lovely, powerful quilt - check it out here. Thanks for reading this far. I feel so strongly about these issues and the March, and, all in all, I hope that quilters will continue to use their voices to speak up about things that are important to them. Much more good than bad has come of speaking out so far. I could not have made this quilt if I hadn't felt so strongly about the cause. I'm thinking about auctioning it off to raise money for an organization, but I haven't decided just how to do that yet. This quilt will be on view in my special exhibition shortly. 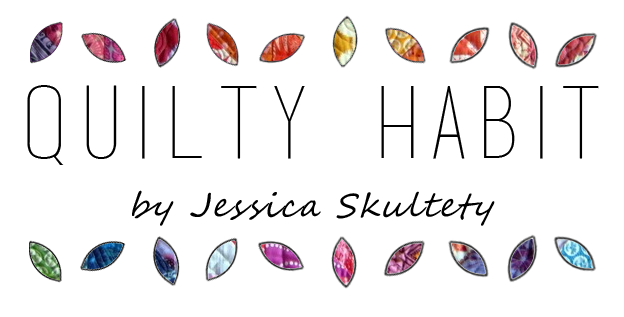 Feel free to share this blog post and the message, if you feel so inclined. We have to keep talking and sharing, but most of all, we need to love and respect each other. Wow! Thanks for sharing your process and feelings. Such a powerful message. And how cool to make it into a quilt! Wonderful! I love the pinked edges, and the back is fantastic. Love the quilt and the messages! And I agree with you 100% - our health does matter. Thank you for making a powerful statement in such a beautiful way. I was marching in Boston (incredible!) and have several friends who were in DC. Your pictures from the March are inspiring. I am so darn proud of you!! I wasn't able to march and I'm so thankful for all who did! Great way to use a quilt! 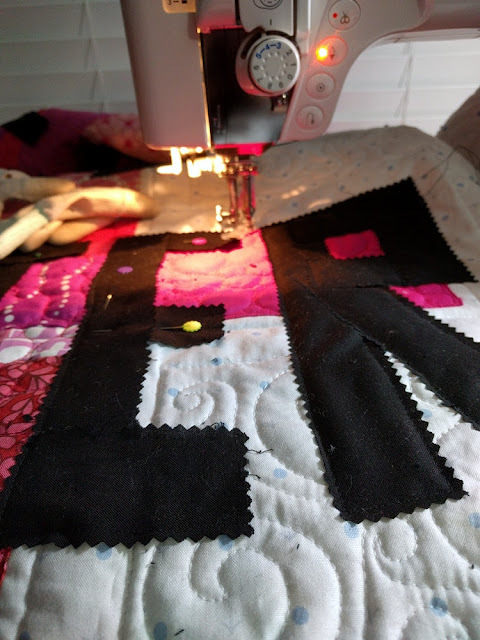 It was great to watch your quilt progress on Saturday as I was prepping to rally here in Indy. Perfect quilt for the march. Glad you went. Thank you, thank you, for making the quilt and putting yourself out there. My only participation ended up being knitting some hats for family members who attended (I had a last-minute family thing that prevented me from going) but I'm so in thankful to all who marched, and to all the women who used their creativity to share what is important for them. And as a side note, I am a woman who cannot use hormonal birth control and for whom an unplanned pregnancy, without immediately starting on medication that costs several thousand dollars a month, would be life-threatening. It makes me so angry when people act like access to (specifically) womens' health care is a luxury instead of a necessity. I am lucky enough to have good access to healthcare but the access I have should be shared by EVERYBODY. Thank you for marching and showing us your amazing quilt! My partner and I went to the march in Spokane--2,000 expected, 8,000 showed up. And this is just the beginning of a movement! Love it!! I marched in Memphis 6000 strong. Thank you for sharing! I came across your blog from a general search about the march and found myself smiling and feeling that sense of hope I felt on Saturday. Thank you for sharing your amazing creation and enthusiasm! Blessed be! I hope some day we can have a march against Hollywood and celebrities that make disgusting films, sing horrible and obscene songs with cuss words, and shameful lyrics degrading women, they make inappropriate gestures that younger people are deeply confused about, and what about those that promote division and derision against any one that does not agree with them? This whole march thing was promoted and organized by a few very far left organizations that I would not want to be associated with. Sadly, I did not see any media attention on the Pro Life gathering in DC by Alveta King. I totally agree. Pro-Lifers were told not to attend. I am posting my replies to the ladies above to start a discussion - I emailed Rosemary directly as I could locate her email. I am curious about which organizations you mean? I am only familiar with the Women's March nonprofit. There may have been other groups that supported it but I am not sure which you are referring to. I am just genuinely curious. Also, for the Pro Life gathering, is that the one that is happening on Friday? If so, maybe the media will cover it then? If not, I'd love to read more about it, as I have not seen anything. Thanks! Thanks for taking the time to comment on my post today. I am just curious about who had said that Pro-lifers could not attend. I did see some pro-lifers there marching. I know that the platform of the Women's March nonprofit is pro-choice, but I did not see anything about people telling other not to come. 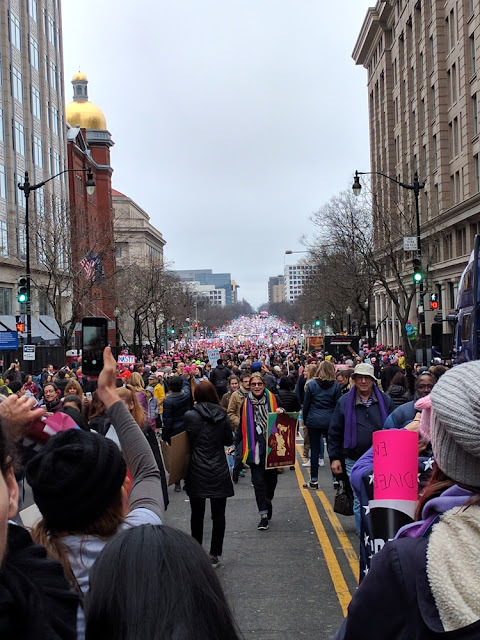 The march was supposed to be a call for anyone who supported women's equality. If that did happen, I am curious to read it. I feel like that's part of the problem - we all get our news from different places. If you could point me in the right direction, I'd appreciate it. Thank you! As always, much love to you. Rosemary, while I marched at a Women's March in Astoria, Oregon (1,300 women strong), I saw coverage of the Pro-Life gathering on MSNBC. Vice President Pence spoke at that rally, didn't he? As to marching against Hollywood, I think many people make their feelings about those things known based on where they spend their entertainment dollars. When a wholesome movie comes along and gains earns a lot of money and takes people by surprise in its popularity, it is noticed, and more of the same-type movies follow. We "march" to the movie theaters or we turn our backs on them (or their cd's or concert) and in so doing, we send a message. The thing is, not everyone is interested in sending the same message. Thank you for sharing your quilt with us. I think many are unaware that one of the organizers of the march, Linda Sarsour is an advocate for Sharia law. Additionally, the "UN"affordable Care Act has proven to be disastrous. So thankful that this will now be corrected. From what was shown on major networks about this march was not representative of me. The language used was beyond inappropriate and I observed many young children were exposed to this. Are these the words women use in their everyday conversations? Let's gather together to pray for our nation and to become united. Pray for our leaders - that they make Godly decisions, that they protect and defend the Constitution and the citizens of our GREAT country. I don't have an email for you so I'll respond here. I appreciate your kind words about the quilt. It was my pleasure to make. If was true about Ms. Sarsour, what does that have to do with the March? I honestly ask that because I don't know. I can't seem to find a neutral/large news site that is reporting about that. In terms of the vulgarity, I am against it as well. My experience at the March in person was *pretty* free of vulgarity but I know that wasn't the case of coverage. News media tends to show the most extreme signs and slogans. In terms of the language itself, honestly, our current President has used similar language. I'm not saying it's justified, but the world knows it, so some are fighting fire with fire. I'm sorry to see you go, but you are completely within your right to unsubscribe. 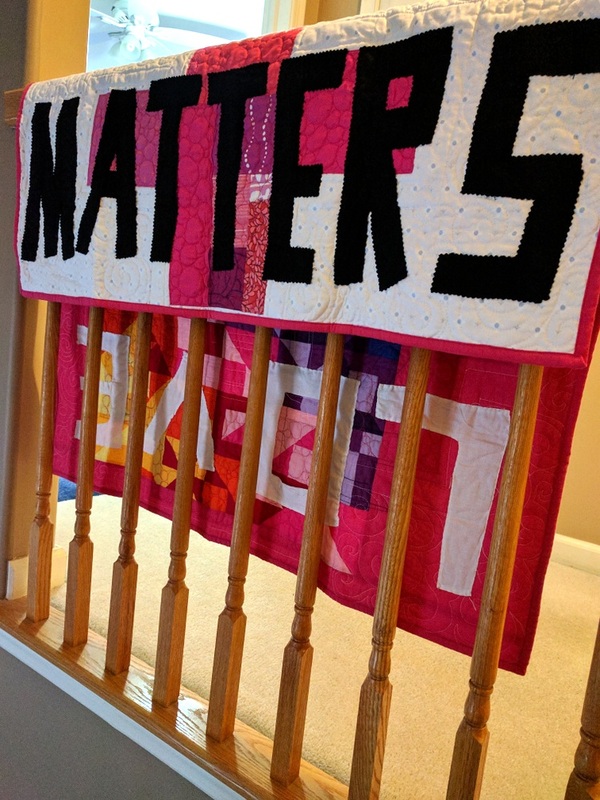 My intent with this quilt was to spread a positive message about something that is important to me, and certainly not to denigrate the office of the Presidency. Thank you for marching! The quilt is beautiful and the message is perfect. 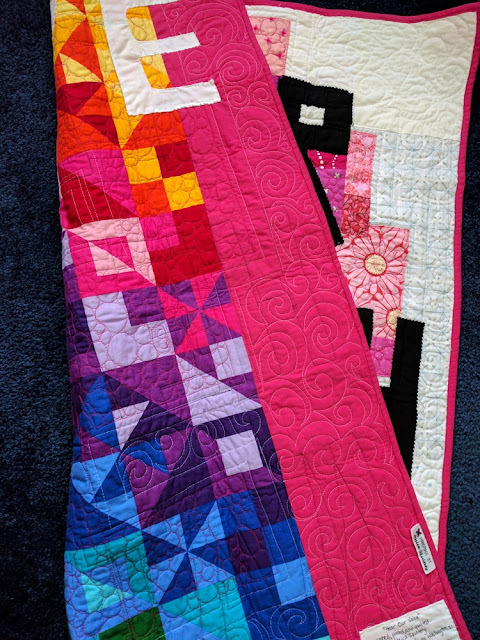 I love the other quilts you pictured, too. Things are pretty frightening right now, but I was happy to see how many people all over the world got out there to protest the new administration and celebrate women. WOW!! THis feels like the start of a charity for women and I'm on board. This is so inspiring. Talent, amazing and you're awesome. Thanks for marching and your message on that wonderful quilt. No wonder folks smiled when they saw it! :-) Now we just have to carry the momentum on! Jess: thank you so much for sharing your creative process and the photos of the march. It makes me so happy to see how many people are willing to stand for equality, justice and caring for one another. I don't see this as an opportunity to start a new "women's charity" as some are calling for. I feel that our government should be the entity to guarantee equality and access to all services needed for women throughout our lives. We have had to depend on charity alone for too long. 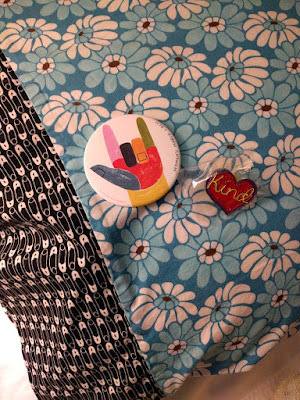 I love everything about this post -- your quilt, your words, the photos. Thanks so much for your efforts and inspiration! So good, Jess. So good. Our march was much much smaller, but it was still all the things you felt, and I was so glad to have attended with my whole family. I hope my girls remember this when they're grown and see how hard we're all fighting for a better future. Your quilt is great and shows an excellent message! I marched in St Paul, MN and the atmosphere was so positive and peaceful! I saw many reasons to march on that day - climate change, education, etc. I see some reference to pro-life activists in an earlier post and all I have to say is that I am pro-choice. I don't want any woman to have to make the decision to have an abortion, but the safe, legal option still needs to remain. One reason why this march was so important - access to modern contraception and safety net providers (Planned Parenthood)are being threatened by politicians who only want to pass moral judgment. SAD! 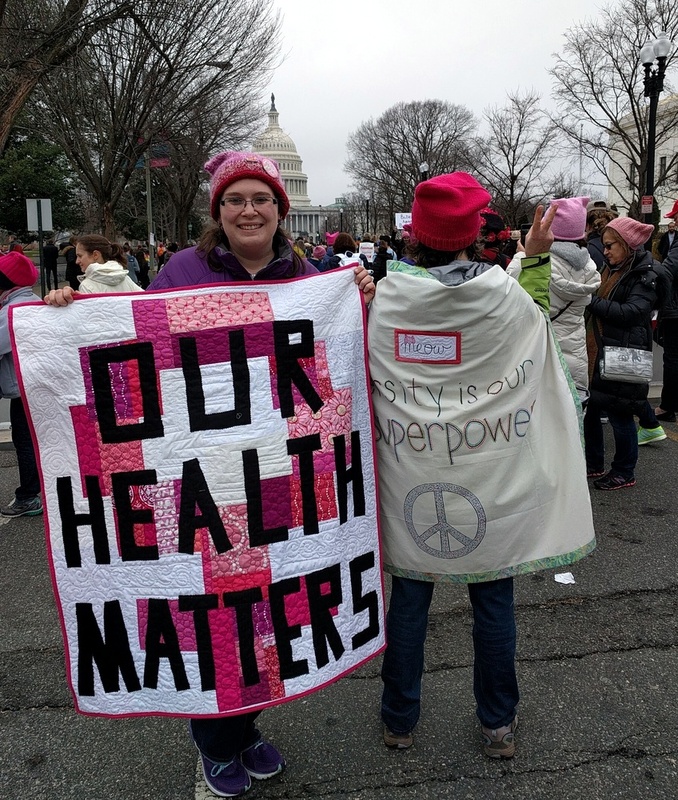 I am so glad that I participated in the march and thank you Jessica for sharing this post, your thoughts, and this beautiful quilt! 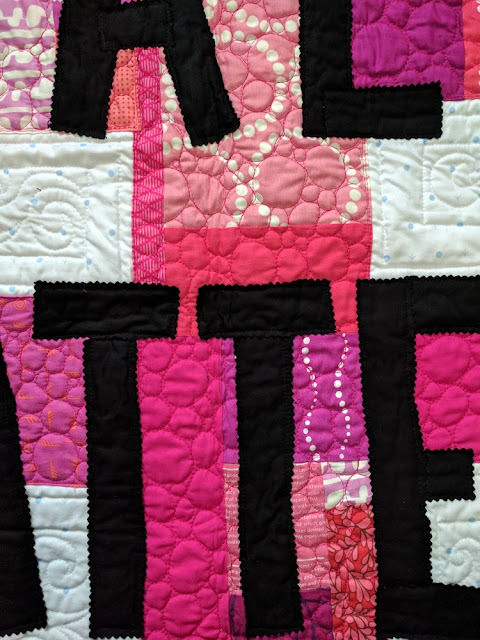 I am happy to see that quilters are conveying important social justice messages in quilts. Jess...and anyone who marched...THANK YOU! This is a time when things are so uncertain. We can be scared or we can fight back and unite. When men can have babies, they can take part in what women choose do do with their bodies. My choice, my body. This march was much more than just about women's choices as you stated. There is no greater time to 'rise up' than now. Stand strong!! People who view the march as anything other than what it was are out of touch with reality IMO! What a wonderful effort and I love that your fellow marchers were admiring your hard work. I'm so proud of you and everyone who marched that day. I'm glad I know you, Jess (and the other CJMQG reps at the various marches)! It's beautiful, Jess! I love the Our Health Matters phrase because it includes those who are pro-life as well as pro-choice. 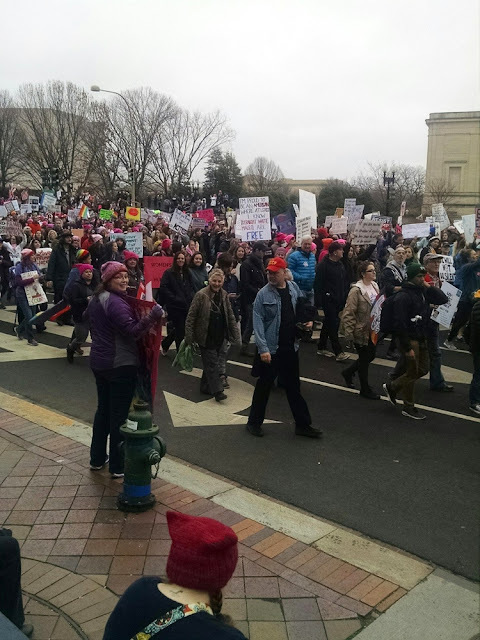 Also, I love all the positive reactions you got, and how much handcrafted items seemed to be a part of the march as a whole (all those hats!). What a beautiful quilt! I bow down to you for being willing to put your craft out there, so courageous. And I share your joy that no one called it a blanket! I marched in Seattle with 174,999 of my peeps and it was an amazing experience. Thank you for doing so much hard work and for marching! I love this so much, Jess! I'm in tears reading about it, and am so grateful that I was able to drag my entire family to the march in Maine's capitol. I love that so many people appreciated what went into making the quilt, too!! That must have made it doubly worth the effort and crazy short deadline! You're an inspiration--so amazing, and I'm proud to be fighting along side of you. We've got quite a bit of work to do! Beautiful quilt, Jess! I marched in Trenton with my friend and our daughters, and although much smaller than D.C., still so many peaceful, powerful messages. Well you made tears flow down my cheeks Jess. THANK YOU. For taking the time to make such a beautiful and heartfelt 'sign' and for writing so well and clearly from your heart about an issue that baffles me as to why it IS such an issue...every human being should have the innate right to say what happens to and with their own body!! Maybe because I live in Canada where this isn't such an issue? However I have a daughter who lives in and went to school in Michigan, and knowing she can now, thanks to Obama, get free birth control, free STD testing etc means a lot as her mother. Studies around the world have shown that Planned Parenthood, and education works. So glad you used your platform to write about this and to show us an actual picture of the size of that march, just WOW, I get all emotional again thinking of it all (SIX hours on a bus)... I think auctioning off your quilt adds even more meaning to what you did. Thank you again. I thought the US was a democracy, and lately I'm not so sure but seeing so many peaceful protests like this gives me hope. Thank you for sharing your wonderful wuilt and your experience at the march! Pure awesomeness! And for the commenter saying anti-abortion women were not invited to march that's not the case. From what I read, they were not included/named as a sponsoring organization of the march. The right call in my opinion. Thanks for raising your voice! I think we will all be called to do this much more for the foreseeable future. Your quilt is very pretty with great skill and careful thought put into every detail. I disagree with you politically but respect your right to protest your feelings. As a woman, I have never once felt as though I was treated less than a man in the workplace or anywhere else for that matter. I prefer to manage my own healthcare and do not think it is the responsibility of our government to provide me with free birth control. I watch entertainers for" entertainment" and do not want to know their political views. I don't talk about my political views with the people I work with or the students I teach. I do not understand why entertainers feel they are any different than me. I appreciate your kind words about the quilt. It was a difficult undertaking a week before but worth it in the end! I respect your opinions as well and am glad that you have felt that you've never been treated less so. I wish that was the case for other women in the world as well, but it simply is not. Thank you for your comment and for joining in the conversation (I cannot locate your email so I do hope you see it here)! Love your fabulous protest quilts. I thought about making message quilts, but instead I made a whole bunch of message hats - so therapeutic and meaningful, and people appreciated the humor. I blogged them at http://gefiltequilt.blogspot.com/2017/01/pussyhats-and-their-afterlife-this.html, and at http://gefiltequilt.blogspot.com/2017/01/political-crochet-nasty-and-nice.html. 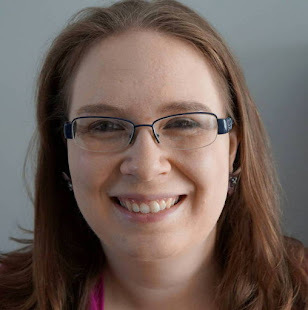 I'd like to include a link to your blog post in my next posting on the subject. Keep up the wonderful work! Thank you for marching on behalf of me and women everywhere. It is a shame that most of women's issues are decided by our government which is largely run by men. What a great quilt, and wonderful story! Never would I have thought to make and finish (!) a quilt in under a week. You have superpowers! The Women's March was so important to energizing us to keep standing up and moving forward... or at least not backward... for women's rights and human rights. I was in Hartford... so much energy, people smiling and peaceful. I've never been in a demonstration where there hasn't been some jockeying and pushing — until now. People made way for others, very graciously. And those in wheelchairs, in strollers, on crutches, were given space and accommodation. The police were being thanked for their courtesies. It was quite an event! You spoke of Planned Parenthood, and one sign at our march grabbed at my heart: "My son would not be alive without prenatal care from Planned Parenthood. Save its funding." That organization provides so much care to so many who might go untreated otherwise. 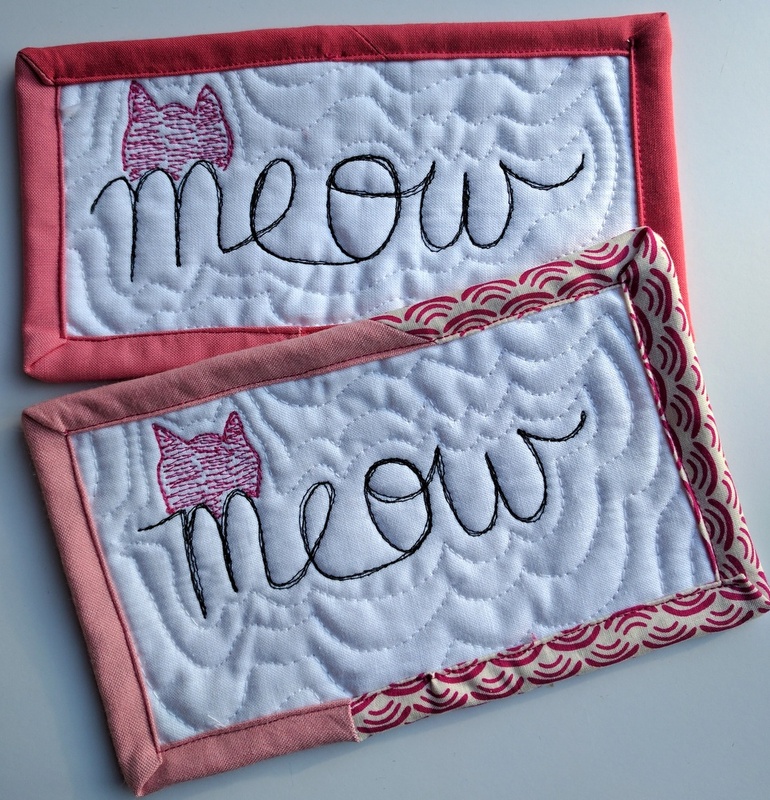 Back to quilting — you've inspired me to make a message quilt — but not in one week! Jess! Old now and in frail health, I was not able to march. So... 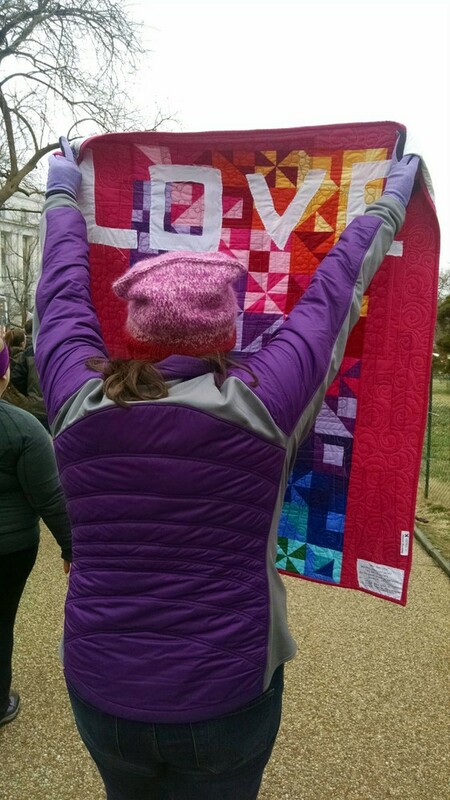 Thank you so much for making the quilt, for marching, and for writing about it. Having come of age during the second Womens Movement, I was desperate to see that the gains so hard fought for 50 years ago, progress made in human rights, social changes, legal changes were all kept and built upon. We have all benefited. What I was seeing was lots of chipping away at the gains bit by bit, vituperation by vituperation. I'm so glad so very glad to see that is not the case, that the gains are valued and that they will be fought for and built upon. Thank you and all the other brave women (and lots of men) who represented so well in marches all around the globe (around the globe!). Joy and love to you and to all the marchers everywhere. 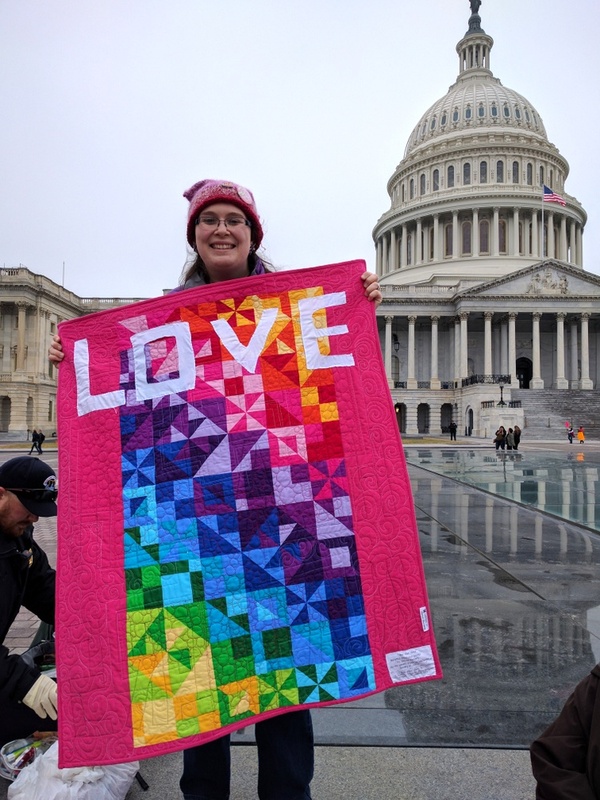 Thanks Jess for marching and for making the quilt and sharing it with the world. I really like your eye catching Women's March quilt. It reads happy! I commend all who took the time to comment. You handled each response with respect and genuine interest. I doesn't matter what my political views are. What matters is that we respect each other's difference of opinions. We are all more alike than different. We all want what is best for our families and ourselves. Maybe this week, we can all try to befriend a person who thinks differently than us. It's a step in the right direction. Don't let labels and the news divide us. Thanks a lot Jess. Jess YOU are amazing! 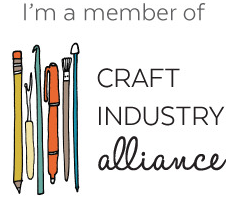 We all know you can quilt beautifully and are wonderfully creative, but that you can channel these talents for a worthy cause and thereby reach so many people is an even greater talent. I hope that you will continue to use your talents to further attract attention to the causes you feel strongly about. You are an example to us all. Hi, Jessica! Loved "meeting you" via your outstanding solo exhibit at the NJ Q Fest yesterday. 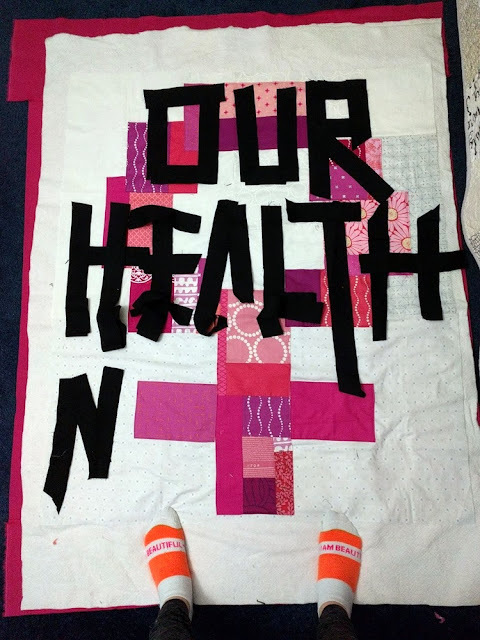 I'd like to feature your quilt, OUR HEALTH MATTERS/LOVE on a website that will launch in 10 days. Please email me at elevie@comcast.net so we can "talk"...or schedule a phone chat. 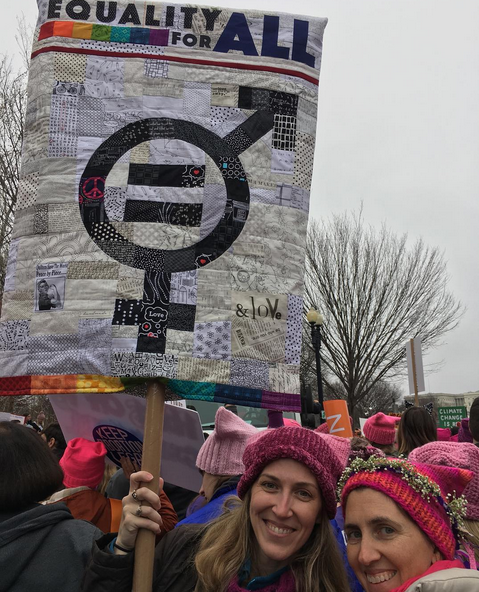 Thank you for making a quilt and bringing it to the Women's March. I couldn't go but my husband and daughter went. My favorite political quilt was "Prosperity is just Around the Corner" I believe it was a 30's worlds fair quilt. Thank you for your comment! That quilt is AMAZING (I just looked it up). It's fantastic how art and quilts can add perspective.